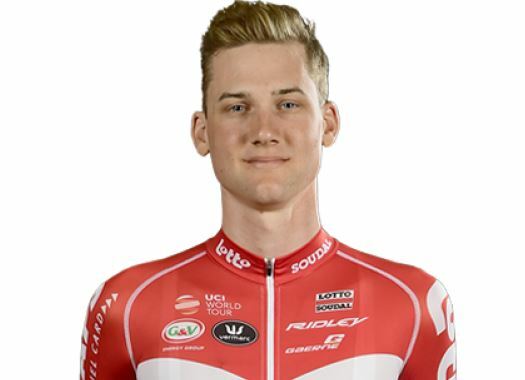 Lotto Fix-All's Tim Wellens has celebrated for the second time at the Giro d'Italia, removing all the stress from him and the team for the rest of the race. The first time that Wellens celebrated at the Corsa Rosa was in 2016 when he won the sixth stage. Two years later, he has already accomplished the main objective he had for this year's Italian grand tour. "Of course I'm very happy particularly because it is just the fourth stage so this releases us from the stress and we can go easy in the rest of the Giro and often when you don't have stress, then things go easier," said the rider at the end of the stage in Caltagirone, Sicily. The Belgian rider now sits at 19 seconds from race leader Rohan Dennis in the general classification, but the objective of putting on the Pink Jersey seems distant to him. "I think I'm a bit too far behind for the Maglia Rosa and I have never done the climb of the Etna so I'm not counting on the Maglia Rosa," he explained. "And I'm just very very happy with the stage win."